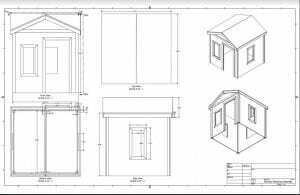 Habitat for Humanity MetroWest/Greater Worcester’s Operation Playhouse (HFHMWGW) project requires a company, or group of people, to sponsor a playhouse. The money made from building these playhouses are applied to their bigger projects centered around helping veterans. However, HFHMWGW has identified a problem with its playhouse design. The cost of the playhouse is much higher than desired. Along with the high cost, the playhouse creates a large amount of material waste. In our research, we described issues with the playhouse project, the impact of the playhouse project, the current materials used and possible techniques that will address the problem Habitat for Humanity MetroWest/Greater Worcester is facing. The current issue with high cost needed to be addressed with the materials purchased. In determining lower cost materials, we had to maintain the high-quality properties. The more important factors were strength, weight, and weather resistance. As for the waste in the design, a database needed to be set up to evaluate the quantity of waste and the areas of crucial improvement. Once the materials and design were examined, an organizational procedure was the next step in reducing the time and increasing assembly efficiency. To determine high-quality materials that are less expensive than the ones currently used for construction. To reduce material waste from each build. To identify a standardized construction method to reduce building time and cost. In order to determine high-quality materials, we needed to contact someone with a professional background in construction. We were able to contact a construction manager and determine which materials would work best for this project. 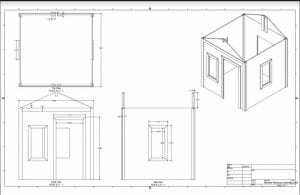 The new materials required for a waste reduced playhouse would be available locally for HFHMWGW’s convenience. We visited the HFHMWGW warehouse and analyzed the material that they use for the playhouse assembly. We observed that 40% of the lumber is wasted for the current design. HFHMWGW also purchases packages of hinges that come with screws. These screws are not used with the playhouse because they are the incorrect size. Since the screws are not the right size, HFHMWGW discards the screws and only uses the hinges. Based on the waste currently produced, we have resolved a method for reducing the waste to 8 percent. To reduce the waste, we created a new design, a document of the waste comparison, and a list of new materials. 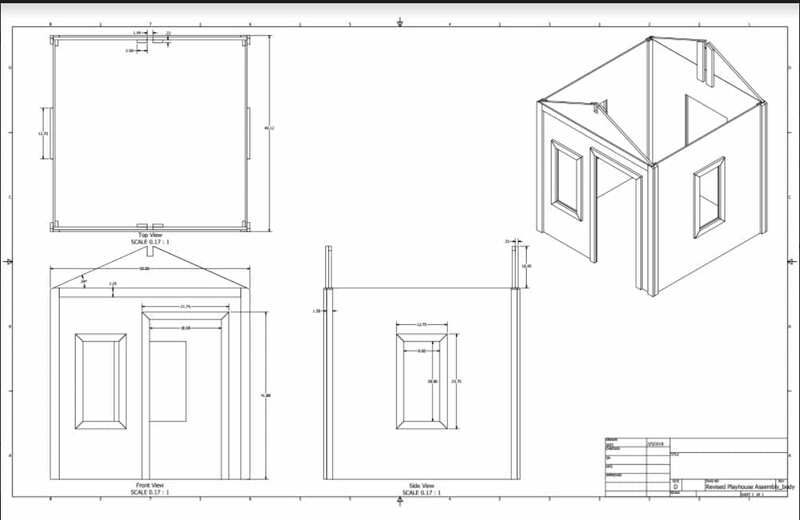 Our team documented a construction process by conducting interviews and an observation of the playhouse build. The interviews provided us with information about the current construction process from a volunteer’s point of view. The observation validated the interview data which allowed us to see what really happens at the build as well as what could be improved in the process. From the interview with past volunteers and through our observation of the playhouse assembly, our team found many different issues that occur that ultimately have an effect on cost, construction time, and material waste. After visiting the HFHMWGW warehouse we were able to see the materials that are being used to create a playhouse. We identified that there are three different types of wood being used for their current playhouse: plywood, oriented strand board (OSB) and pine. The plywood is used to make the walls of the playhouse, the OSB is used to create the roof and the pine is used to make the trim and window stops. During our observation at the playhouse assembly at Hanover Insurance, we noticed that the volunteers relied on assembly instructions from group captains and HFHMWGW volunteers. At the beginning of the build, we observed groups that were not sure of what parts they needed. This resulted in different groups having different parts of playhouses. When volunteers assembled the playhouses we found volunteers became confused on which type of screw is used for what job. Even groups with a team captain became confused as to which screw went where on the playhouse. Once we visited the HFHMWGW warehouse we found that HFHMWGW buys six boards of wood: two are OSB and four plywood. With the cuts that are made for the parts to the playhouse only using 60% of the wood. Our team found many different issues that ultimately influence cost, construction time, and material waste. From our visit to the HFHMWGW warehouse, we reviewed the materials that are used to create a playhouse. We identified three different types of wood used in the current playhouse: plywood, oriented strand board (OSB) and pine boards. The plywood is used to make the walls of the playhouse, the OSB is used to create the roof and the pine is used for the trim and window stops. Our team found it more cost-effective if HFHMWGW switched to 19/32” sheathing plywood and 23/32” BCX pine plywood. For hardware, we concluded it would save money in the long term if HFHMWGW purchased screws in larger quantities, as well as using a Philips head 1-⅝” screw instead of the 1-¾” T25 screw. By switching to these two types of lumber, and ordering screws in larger quantities, HFHMWGW can nearly cut their total price per playhouse in half. In Chapter 5 of our Final Report, we discuss the new design that we created. The new design eliminates the need for six boards and instead requires only four. There are two sheets of each of the lumber as previously mentioned. The sheathing plywood for the walls and the BCX plywood for the roof panels and trim. From our findings, we recognized a few flaws in the current construction process. 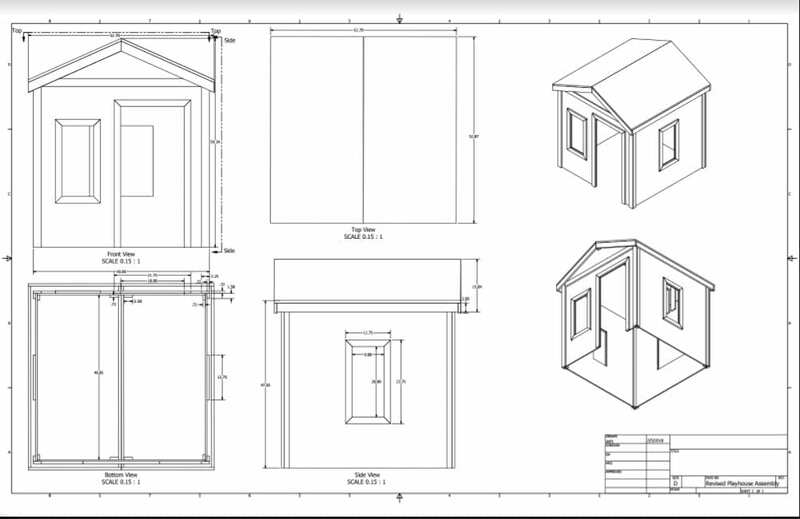 We noticed there was confusion about the part location and use of equipment throughout the assembly, so by incorporating an assembly guide we can discard any disorientation with the steps for the trim, roof, shingles, and other parts to the playhouse assembly.